Hello!! 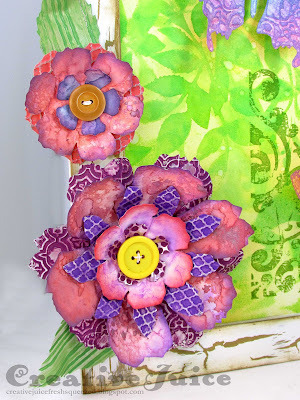 I am very honored to be a Guest Designer on the Frilly & Funkie blog for their current challenge, Welcome Spring! Be sure to head on over and check out all the inspiration. Here you'll find the complete tutorial for my spring decor project (soon to grace my fireplace mantel). 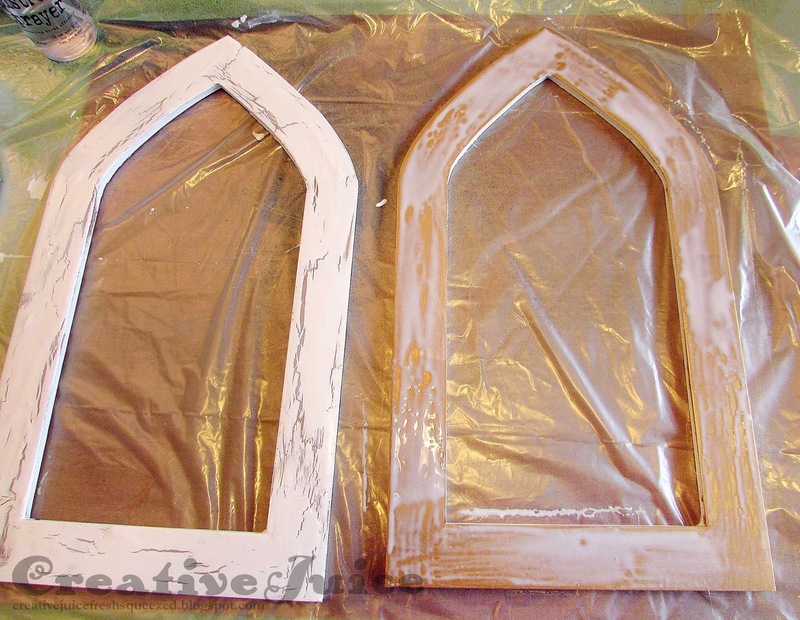 Step 1 – I used Distress Spray Stains and a leaf stencil to create the background in the arches. First I misted the heavy mixed media paper (Strathmore brand) with Squeezed Lemonade and Wild Honey, adding misted water to help it blend. 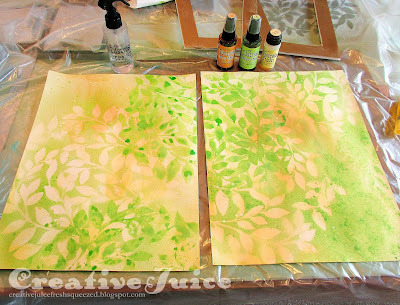 After it was dry, I laid down the leaf stencil and misted with Twisted Citron. After removing the stencil and lightly drying the paper with my heat gun, I flipped the inky stencil over and used it to make a monoprint on top. I couldn't let all that stain on the stencil go to waste! ;-) Additional splattering with water added more texture. 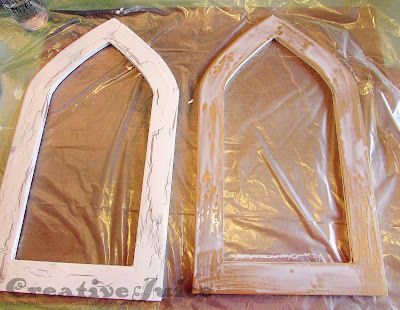 Step 2 – I drafted out the arches in a graphics program and printed a template to use as my cutting pattern. Using a sharp craft knife, I cut them out of foam core board and base coated them with gold acrylic paint. To achieve the mega crackle effect, brush a generous layer of cheap PVC glue (like white school glue, don't use your good stuff!) onto the surface. Let it dry slightly (I only waited a few minutes) and then brush a layer of paint right over the glue. I used a generous amount of glue on my brush and lightly applied it over the glue layer. Don't overwork it. It should start to crack almost immediately. Just leave it alone and let it do its thing. 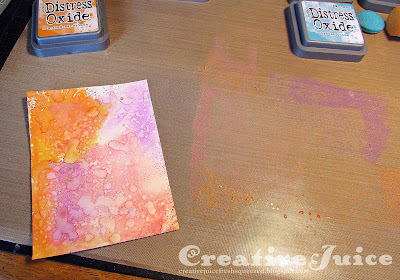 After spritzing them with water to make the ink react, I embossed them in the matching embossing folders and did additional inking with the blending sponges to bring out the embossed designs. Step 4 – Flowers and more Oxide Ink fun! 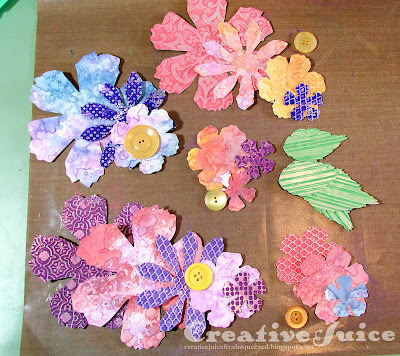 To create the swatches I cut the flower parts from, I smooshed the pads onto my craft mat, misted with water and then dragged my paper through the ink. (Tim Holtz did lots of CHA videos explaining the inks.) I misted and sprinkled with water, added more layers of ink and had a blast. 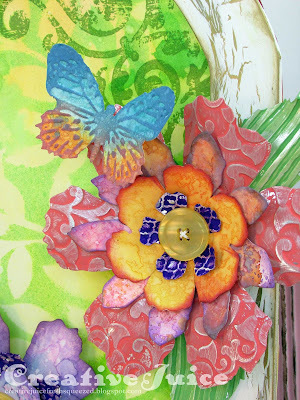 Once I had several inked papers, I used the Jumbo Tattered Florals die to cut them up. I also cut layers out of metal sheets, embossed them, and painted them with Distress Paint. I bent and curled the layers before assembling to give the flowers more volume. 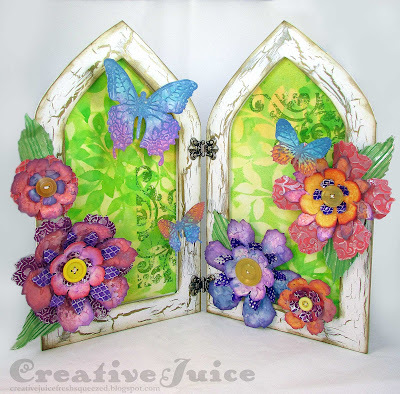 I used a hot glue gun to attach the blooms and butterflies to the arches. FABULOUS home decor piece for spring--it has got me wanting to go out and garden! 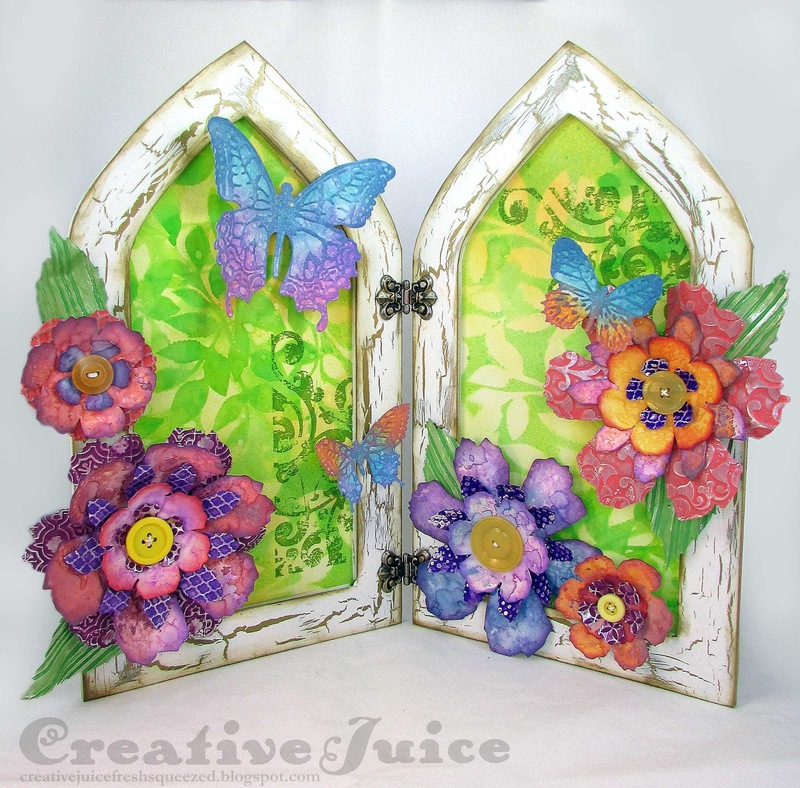 I love your arches and beautiful leafy background--so pretty, and the glue technique for crackling your arches yielded amazing results! 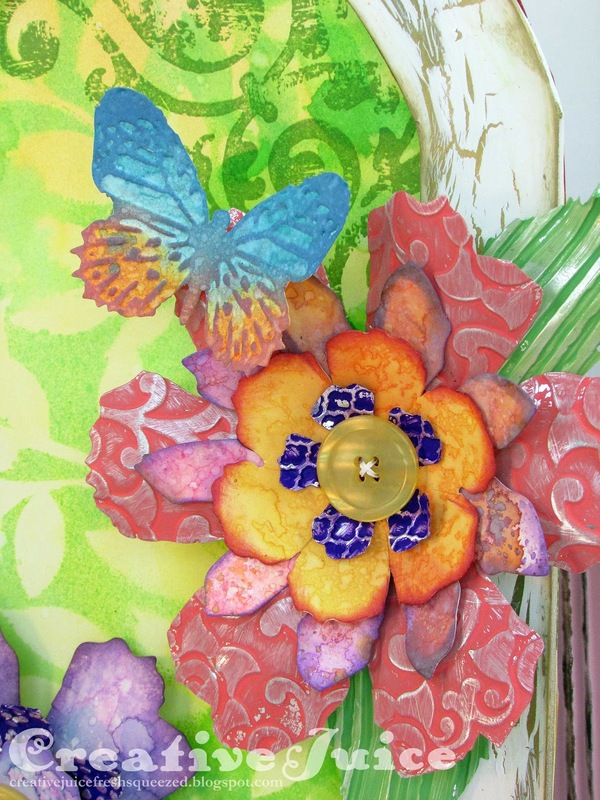 The flowers are gorgeous, and you seem to have mastered those new Oxides! I've at least got mine labeled! Ha! Ha! Congratulations on your well deserved Guest spot at Frilly and Funkie!